Crispy eggplant parmigiana! Crunchy crumbed eggplant slices, served with rich tomato sauce, insanely milky fresh mozzarella and super fresh and fragrant basil pesto. Could not be more delicious! 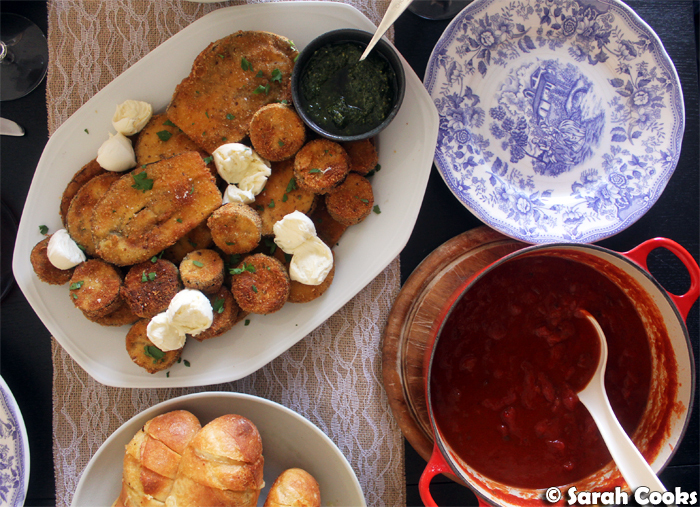 I made this dish when we had friends over on Easter Monday and it went down a treat. My crispy eggplant parmigiana is basically a mash-up of the traditional Italian and American versions of this great dish. The Italian parmigiana di melanzane is a baked dish made up of layers of fried eggplant slices, tomato sugo, cheese, and breadcrumbs. (See my eggplant and zucchini parmigiana recipe for an example). In the American version, eggplant slices are crumbed and fried before being layered with the sauce and cheese. Both have their charms, but I really wanted to emphasise the crispiness factor of the crumbed eggplant. I also liked the idea that all the components would be served in the centre of the table, and that people could make up their own plates with as much or as little of each component as they liked. The mozzarella balls and basil pesto are both store-bought (although obviously make your own pesto if you prefer), and the tomato sauce is a simple pasta-type sauce. You sauté some onions, add some tinned tomatoes, and cook until thick. Ordinarily I'd add a few shredded basil leaves as well, but it always seems like such a waste to buy a whole bunch just to use a few leaves, and then have the rest of the bunch wilt, depressingly, in my fridge. Basil pesto provides the same green peppery freshness, but without the wastage. (I adore pesto and am always happy to have a jar on the go). The tricolore effect of the red-white-and-green is also very pleasing to my eye! Now, let's talk about the crispy eggplant. I like to use a variety of eggplants (some round, some slender Lebanese ones) and slice them differently to get a variety of shapes so they look pretty on the platter. These pretty slices are crumbed and fried just like a schnitzel. 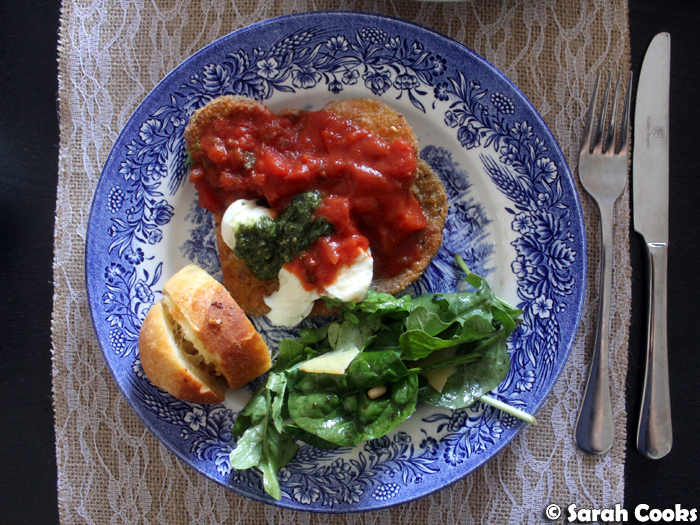 I've always loved schnitzels - they were one of the first things I taught myself to cook (as an intrepid eight-year old, standing on a rickety stool next to the stove), and ever since German Sandra came into my life twelve (!) years ago, I have been inspired to continuously lift my schnitzel game. 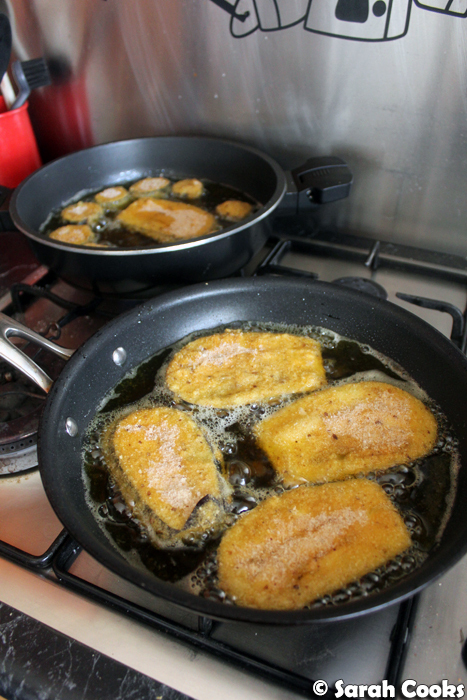 Let me share some schnitzel tips with you. (I've shared some of these previously, but they're good tips and bear repeating). First up, good seasoning - salt, pepper, and cayenne in the flour; oregano and dijon mustard in the egg; and lots of grated parmesan in the crumb mixture. You wanna get the flavour all the way through. When dipping the slices into the flour / egg / breadcrumbs, use one hand for the dry dipping, and one hand for the wet dipping. This will help avoid the dreaded schnitzel fingers. Next up, you want to make sure the slices get crispy, and stay that way. Let your crumbed slices dry on a wire rack before frying. Make sure you use a good layer of oil, deep enough so the eggplant slices will be able float in the oil - "Sie müssen im Fett schwimmen!". And make sure the oil is hot before adding your eggplant slices, so that they start cooking straight away and don't just sit there absorbing cold oil. The slices should sizzle as soon as they hit the oil. (I like to test with some breadcrumbs first). Finally, once the slices are cooked, place them on a wire rack to drain in a low oven to keep warm while you cook the rest. Letting them sit on a wire rack, instead of a plate or paper towel, prevents steam from building up and stops them from going soggy. That's a lot of tips. I guess I'm just deeply committed to the idea of your eggplant parmigiana being the best it can be. I believe in you. Because this was a big quantity, I had two frying pans on the go. Efficiency! 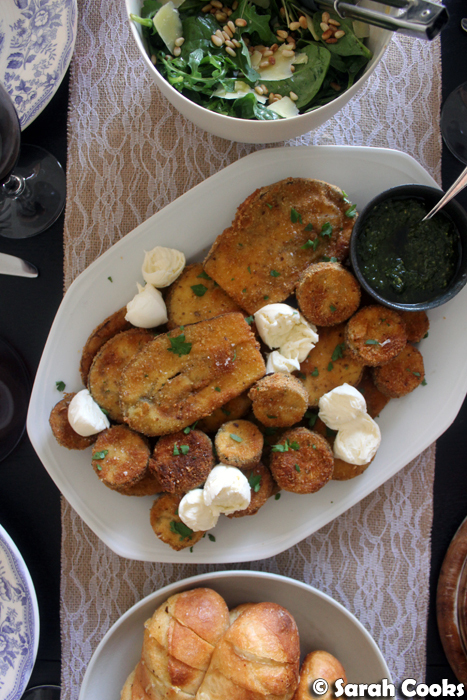 Once they're all cooked, you arrange the eggplant on a big platter with the pesto and cheese, and let everyone dig in! I served the eggplant parm with a green salad and some cheesy garlic bread. The green salad was a simple mix of baby rocket and baby spinach leaves, dressed in balsamic vinegar and extra virgin olive oil, with toasted pine nuts and shaved Parmesan. And the bread. The bread! I did Nigella's chilli cheese garlic bread, which comes from her latest book, At My Table. I've made it a bunch of times and it is and is so damn good! You must. To make the sauce, heat the olive oil in a heavy-based saucepan over a medium heat. Peel and finely chop the onion and add to the pan. Season with salt and pepper and cook until softened. Add the crushed tomatoes and bay leaf and bring to the boil. Turn the heat to low and simmer for 20 minutes or until the sauce has thickened. Taste and season with salt and pepper. Remove the bay leaf to serve. To make the eggplant, trim the eggplants and slice into 1-cm thick slices. Set out three shallow bowls. In the first bowl, place the flour and cayenne. Season with salt and pepper. In the second bowl, beat the eggs with the dijon mustard and oregano. In the third bowl, mix the breadcrumbs and grated parmesan. 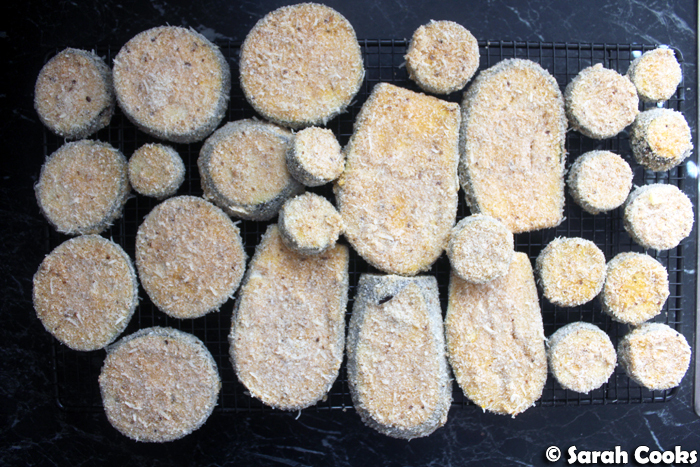 Dip each slice of eggplant into the flour mixture, followed by the egg mixture, followed by the crumb mixture. Place on a rack while you crumb the remaining eggplant slices. (Tip: have one "dry" hand and one "wet" hand to avoid schnitzel-fingers). Heat 1 cm of olive oil in a frying pan. Once shimmering, fry the eggplant slices in batches for a few minutes on either side until golden brown and cooked through. Keep the cooked eggplant slices warm in a low oven (75C) while you cook the remaining slices. If you have a wire rack that can go in the oven, use it! This will help keep the eggplant crisp. To serve, arrange the cooked eggplant slices on a platter. Break up the mozzarella balls and arrange among the slices. Finely chop the parsley and sprinkle it over. Serve with basil pesto and the tomato sauce on the side. Completely agree! I only like to deep-fry if the results are worth it! And I think they're totally worth it for this recipe! I salute your commitment to crispy parmigiana!